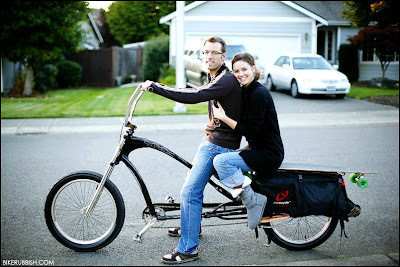 Another cracking photo from our mate Derek Pearson of Bikerubbish.com in Washington, USA. Thanks, mate. I've discovered that many people pronounce the title of this blog [lifestyle, movement, source of inspiration] as Chic[k], to rhyme with 'flick' or 'kick' or 'Titanic' but we'd just like to point out that when pronouncing Chic you'll be wanting to say so that rhymes with 'sleek', 'cheek' or 'fantastique'. In other words, we're not aiming for the US English 'Chick', which orginates by the way from the Spanish 'chica' for girl. We're aiming for the French word, 'Chic' meaning "smart elegance and sophistication especially of dress or manner". I knew that, but I found the fancy description by googling. Did you know you can type define:YOURWORD into google and press enter? It finds word meanings if you do. Try it. It's cool. 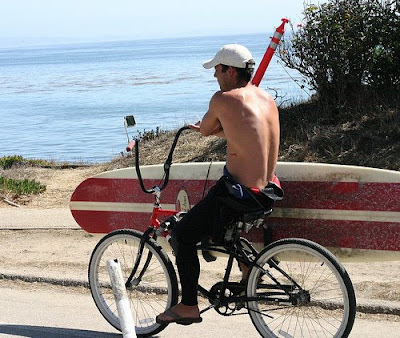 So is riding your bike complete with a surfboard rack. Thanks to Richard of Cyclicio.us fame, over in Santa Cruz, USA, for getting out there to snap it upon our request. Let them know you ride chic and aren't afraid of telling people about it. great pics + a fun grammar lesson, WOW, thanks! It seems to tickle you that we'd get it wrong and I hate to begrudge you, but...Americans don't say 'chick'. We pronounce it properly. thanks, village mama and katie. although katie, it is mostly americans and canadians with whom i've spoken that say 'chick' instead of 'chic', and that spawned this post. Just want to mention that to an average American, 'fantastique' could easily be pronounced to rhyme with 'titanic' and other ick-ending words. And yes, Americans do say 'Chick' I hear it all the time, even in a center of cultural diversity like The Bay Area. Don't hate us we just don't know any better! Any American of the Disco Generation should know how to pronounce "CHIC." Who can forget: "Ahhhh, FREAK OUT! Le Freak C'est Chic"? Thanks for the photo and link love! Love this Blog. Mange tak. I love the longboard in the picture.